While out one day I spotted this hawk. He appeared to be taking in the goings on along the path. As I got closer I noticed a black band around it's neck. He didn't seem to be in any type of discomfort so I thought the band was some type of transmitter. As I walked closer the band looked very much like one of those hair bands women where. Closing in for a better photo the hawk departed. I had hoped that no harm was going to fall upon him. Several days later I saw what appeared to be the same hawk minus the neck collar. I hope it was the same bird and all is well. A lovely river I manage to get to several times a year. I would frequent it more often only it's location is in a tough location of Connecticut. The traffic can be a nightmare on a good day. 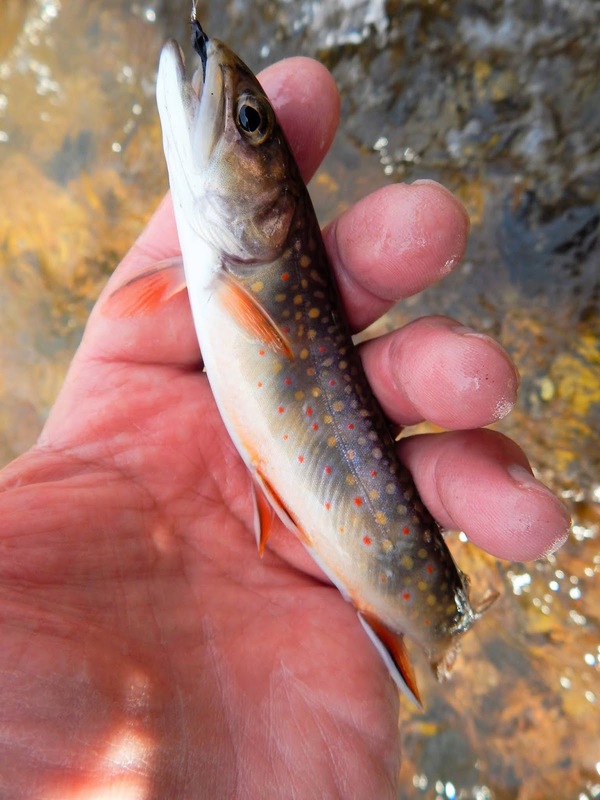 The river has some beautiful pools and these pools are home to wild browns and brook trout. On this day fishing was slow but the two hookups I had came to hand. A well known artist and author loves this river and after spending time here I can understand why. There is a stream I'm quite familiar with. 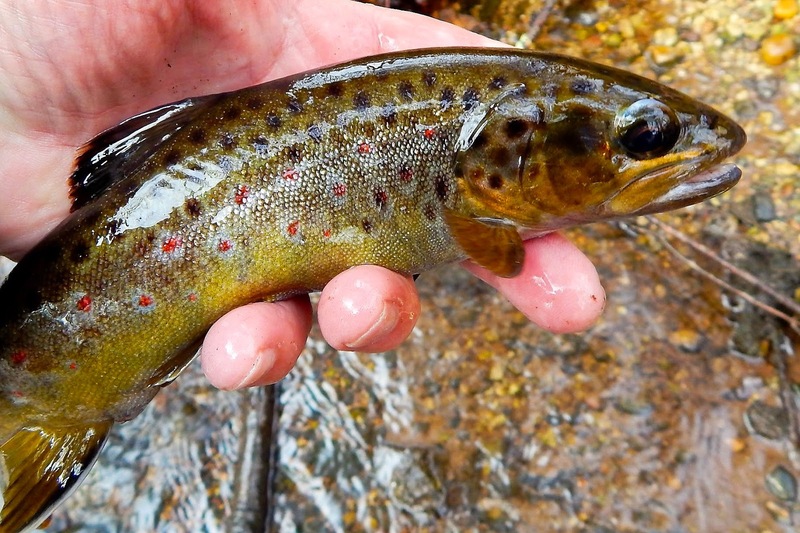 I have fished this stream many times over the years and have taken a lot of beautiful trout from its waters. 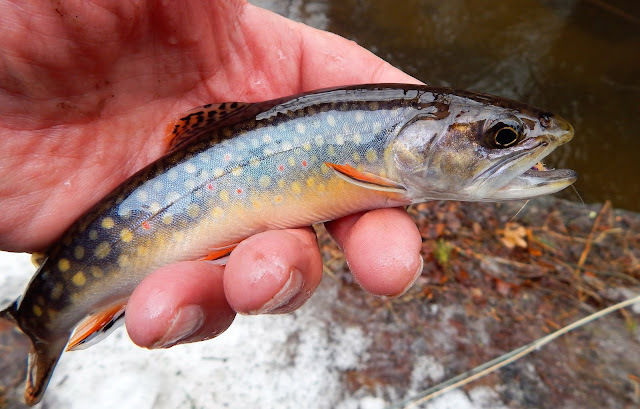 The trout mostly browns with the once in awhile brookie thrown in. In as much as I have fished the stream there are places I have not paid much attention to. The area where the stream flows is somewhat problematic as far as walking along the bank or wading. The slow flow and deep pools cause silting and some pretty impressive areas of calf deep mud. The suction that these mud areas possess can be scary. Though the slow flows here look like it may be shallow it is not the case. Some sections are deep with some very inviting submerged woody debris. This pool is where I saw a very big brown trout on Monday. The fish was holding in the calmer water just downstream. As I walked to the edge to make a cast he bolted to the deep roilly section and and was gone. My estimation of the size of this brown was 16". This would make it "if caught" my personal best small stream wild brown. I will seek this fish, and it will have to be in the next few months. I suspect the stream warms in this area and he will likely move out to cooler waters. I have just the flies that I think will bring this brown up. Several years ago while selecting feathers from a partridge skin I noticed the tiny bit of fluff at the base of the feather. The material was like marabou or cdc in that it moved so life like when I blew on it. I started tying many of my soft-hackle flies using a bit of this fluff wound on with the feather. This is a partridge feather with the soft marabou fibers at the base. While I do use feathers like this, I prefer to take a few more fibers of the marabou off. Here is the fly with the marabou and partridge tied in. If you look closely you can see the marabou fibers. 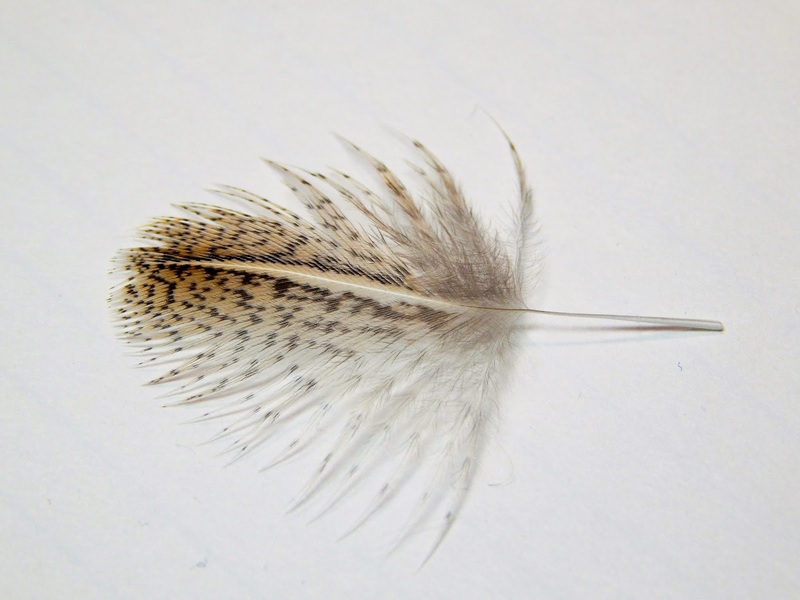 These are soft-hackle feathers selected to tie flies with. On the left are grouse feathers, the middle are woodcock and on the right are pheasant. The marabou is clearly visible. The three flies below are tied with these feathers. While these feathers with the marabou don't make a large difference in the overall effectiveness of the fly they do help to get that undecided trout to take the fly. Any extra movement is a plus. Yesterday was a day of first's for me. Yesterday was the first day of Spring, and it sure felt like it. I got to the stream around 10 and found myself engulfed in an almost perfect day. The sun was out brightly and it's warm rays felt so good. There was almost no breeze, and the skunk cabbage was busting out all over the place. 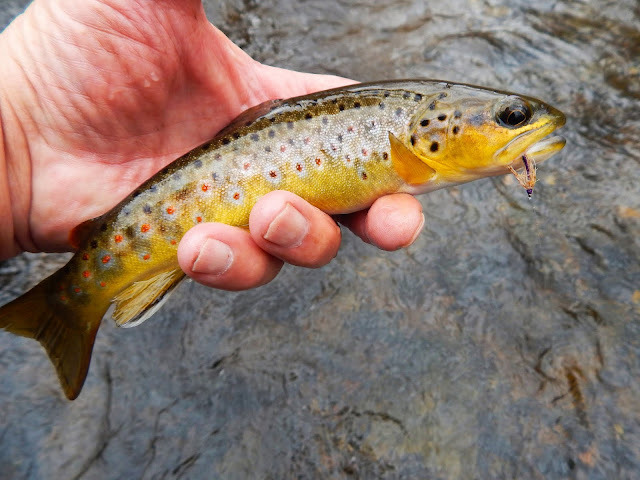 It was going to be a great outing, I just had that feeling that no matter how the trout reacted it was not going to change how I was feeling overall. Another first of this day was the fact that I finally had the chance to put my new bamboo rod to the test on the stream. I had cast it on the lawn with a couple of fly lines, but this was the first real test of this beautiful piece. 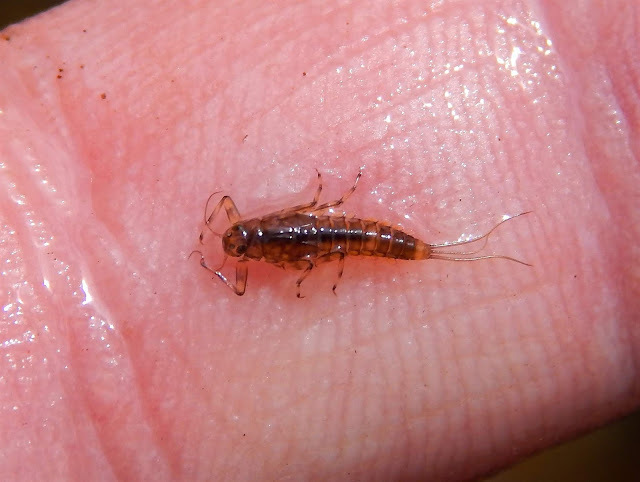 As I walked the stream I noticed lots, I mean lots of stoneflies about. They were on the rocks and in the air. I chose a stonefly imitation which was nothing more then black thread with black dubbed thorax with starling hackle. 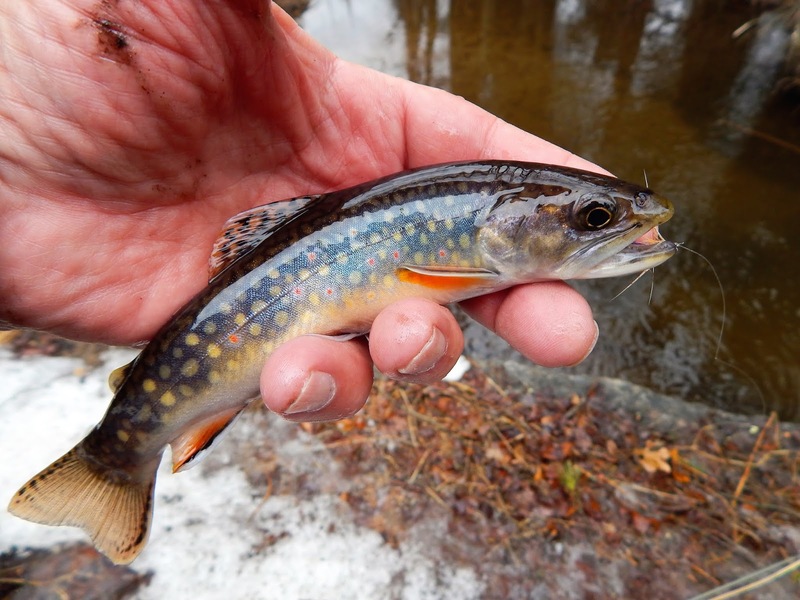 Several casts in several locations yielded two hookups which yielded quick losses. I know this may sound corny but being out on this day just walking alone in the peace and quiet of the woodlands with a fly rod and the hope that this was the first of many days I hope would follow. Finally after several hits and a couple of lost hookups I found this wild brown. He has the distinction of being the first trout taken on the SSR's cane rod. It was along this run with it's inviting pool that I noticed several fish rise. They were smacking stoneflies. The rises were very striking. I tied on a dry fly which was also very simple. Black thread and palmered hackle. It did not take many casts before a trout rose and a solid hookup. This young lady demonstrated why she was queen of the pool. She showed me how a fine bamboo rod should handle her strength. Both fish and rod performed flawlessly. Both doing their part to show what small stream fishing is about. Those of us who tie flies, especially those who tie soft-hackles and spiders know that a famous maker of fly tying silk which is used in the construction of so many of the soft-hackles and spiders. The Pearsall Gossemer silk is no longer on the market. The availability of some odd colors and from sources such as estate sales and ebay are pretty much the only places to get Pearsall's. A couple of years ago I was made aware of another company offering a silk thread. The company name is YLI. Since I first learned of YLI's offering's I have purchased several colors and have tied many flies using it. It offers the same quality as Pearsall's, and it holds what I consider to be most important factor in silk thread it's true color when wet. Above is a spool of YLI olive thread. Olive is one of my staples and many of my flies use olive silk as a body. Here is a spool of Pearsall's silk thread. It is a chestnut brown and one of my favorite colors for soft-hackles and spiders. I have several flies tied with both YLI and Pearsall's. Using thread bodies and both grouse and woodcock feathers for hackle. The first is a Woodcock and Olive. And this one is a Grouse and Chestnut. Now you can see the colors of both silks as they are dry. The test taken was to show what they look like when wet. You will see that they hold their color. Some threads will darken when wet and that's OK in some cases. But I prefer they stay true. Does all this color make a difference to the fish, I would say it does. March is about the toughest month for small stream angling, at least for me. I can fish a section of stream that has produced for me in the past and I won't even get a bump. It does not matter what I'll fish for it seems most everything will be rejected. I guess the transition is felt more by the trout I seek than the way I feel at the time I'm on the stream. 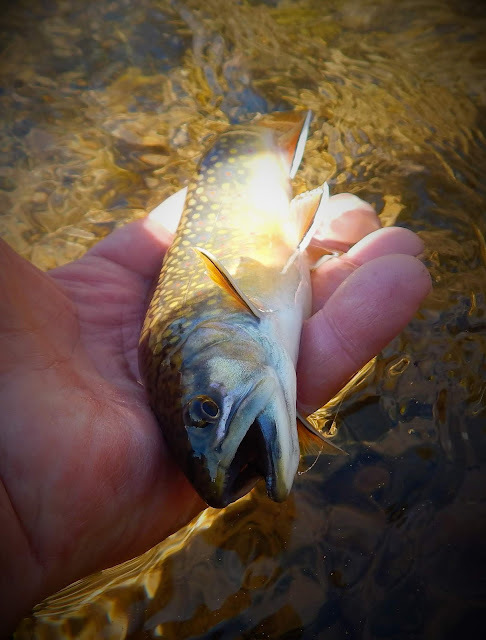 I fished a few days where it was gorgeous, warm and sunny with perfect stream flows. I saw a few bugs about but not a taker. Trout above and trout below. This antiquated dam from years past keeps the stream divided. These useless relics must go. The section above the dam was very nice. 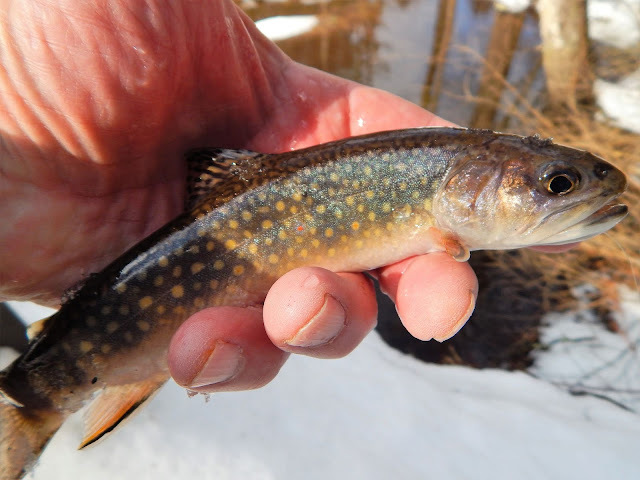 I gazed into one pool and saw several small brook trout just sitting almost motionless. I cast fly and let it drift. In a moment I saw the line hesitate. Here is one brookie that was hungry. So for a March day I'm satisfied.